We find ourselves increasingly on the lookout for unintentional or accidental microgrids, since the concept was introduced on Microgrid Knowledge by David Chiesa of S&C Electric. It looks like a new partnership between National Grid and Sunrun could create accidental microgrids. Accidental microgrids are not planned, but reveal themselves as the obvious culmination of other upgrades made to the grid. Resources often found inside microgrids – maybe solar, energy storage and distribution automation — are installed on the grid without the intent of creating a microgrid. But when a utility or developer steps back and notices the resources and their proximity, they see the possibility of smartening the assets by adding a microgrid controller. The assets then become a microgrid that can form an island during a power outage to keep electricity flowing to customers. During normal operations, the microgrid may supply its own customers as well as provide services to the central grid. The National Grid and Sunrun partnership is about installing residential solar and storage. But plans by the utility and solar developer extend beyond just supplying green energy to the homes. They hope to use the resources to serve the grid. 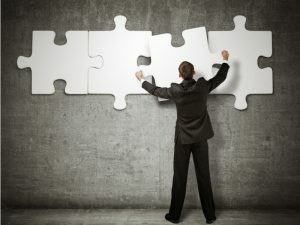 Specfically, the partnerhip plans “to explore options of how distributed energy resources might be aggregated and used to help keep the energy grid balanced and optimized. Currently these services are typically provided by centralized generators,” according to a news release the companies issued yesterday. The pair intend to start with 100,000 home rooftop solar systems in the microgrid-friendly state of New York. They also plan to own about 200 MW of residential solar assets across Sunrun’s markets with a $100 million investment by National Grid. First the good news. Renewable energy – solar in particular – saw a lot of growth in 2016. Of the 24 GW of new generation that came on line last year in the U.S., more than half is from renewable energy, according to the U.S. Energy Information Administration. This is the third straight year that renewables have showed such market dominance. Now for the bad news. Despite the growth, solar companies raised a lot less money this year compared to 2015. 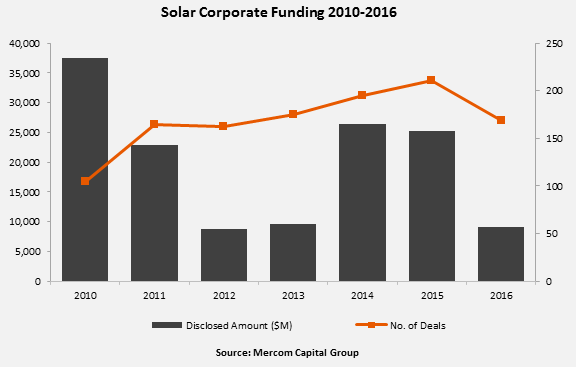 Mercom Capital Group reports that total global corporate funding in the solar sector, including venture capital/private equity, debt financing, and public market financing, raised by public companies was only $9.1 million in 2016. That’s a 64 percent drop compared to $25.3 billion a year earlier. Mercom expects better things for 2017 as lower module prices boost installations further. Recent research by Bosch shows that consumers are definitely on board with the idea of driving electric vehicles. An impressive 62 percent of U.S. new car buyers believe they will own at least one electric vehicle within 10 years or less, according to research from Bosch. But range anxiety and other worries persist. Consumers are concerned about vehicle reliability, distance between re-charging stops, time required to re-charge, purchase price and cost of repair and maintenance. 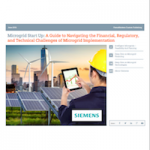 Interested in microgrid news? Read more by subscribing to the Microgrid Knowledge newsletter.